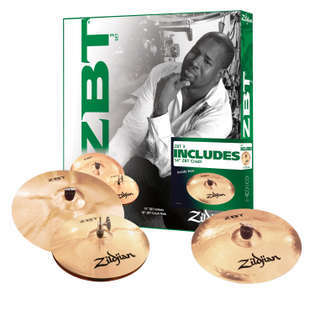 The Zildjian ZBT Series Starter Setup Pre-matched cymbal box set includes 13" HiHats, an 18" Crash-Ride and a FREE 14" Crash. For the money this is a good deal. I would only recommend these to a beginner though. Pretty soon you will most likely want better quality cymbals as most of these are really not that good. They're better than the cheap cymbals that come with many beginner kits though. The hi-hats are the best out of the set and these would actually work pretty well even if you upgrade the rest of these if you play louder music as they are very bright and cutting. I bought this cymbal set to replace the cheap tin can cymbals that came with my son's entry level drum set. These were highly recommended by his percussion coach. Not wanting to spend a small fortune, the price was very nice. I didn't realize just how bad those other cymbals sounded. Well worth the money.